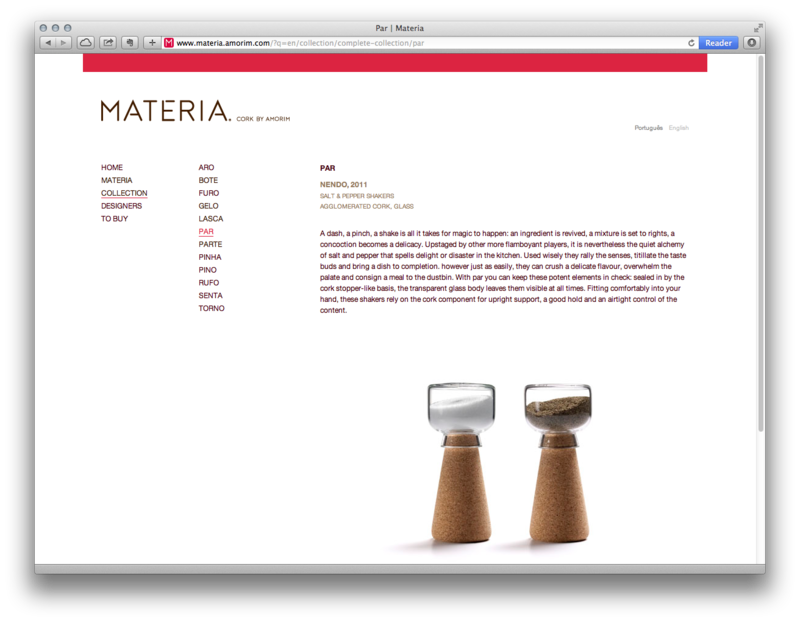 Website for ExperimentaDesign and Amorim promoting design using cork. Spearheading this drive for innovation is the Portuguese company Amorim, world leader in the cork industry. In addition to high-performance applications for the aeronautical, construction and wine-producing industries Amorim is now looking to put cork center stage into the everyday. 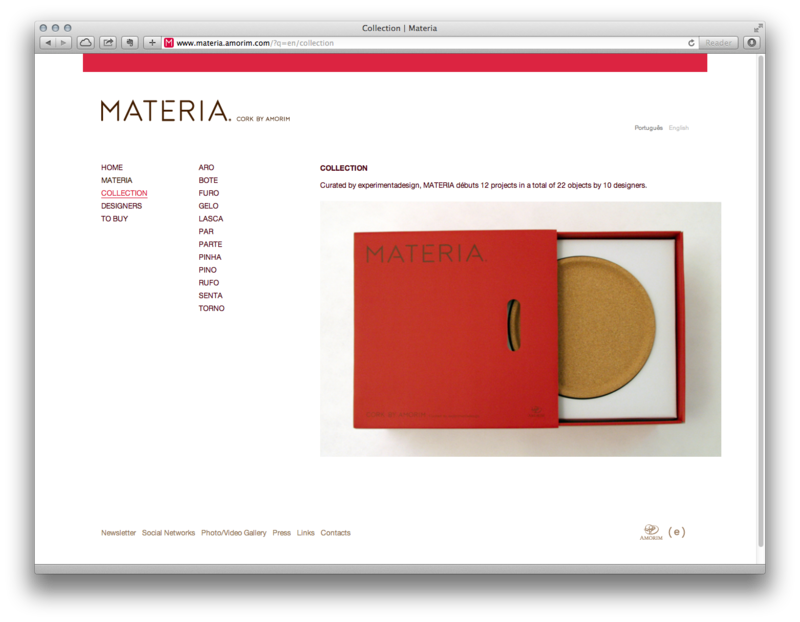 Fusing the material’s unique sensory qualities and personality with a designer’s flair, MATERIA is a collection of objects that work well and feel good in contemporary homes and lifestyles. 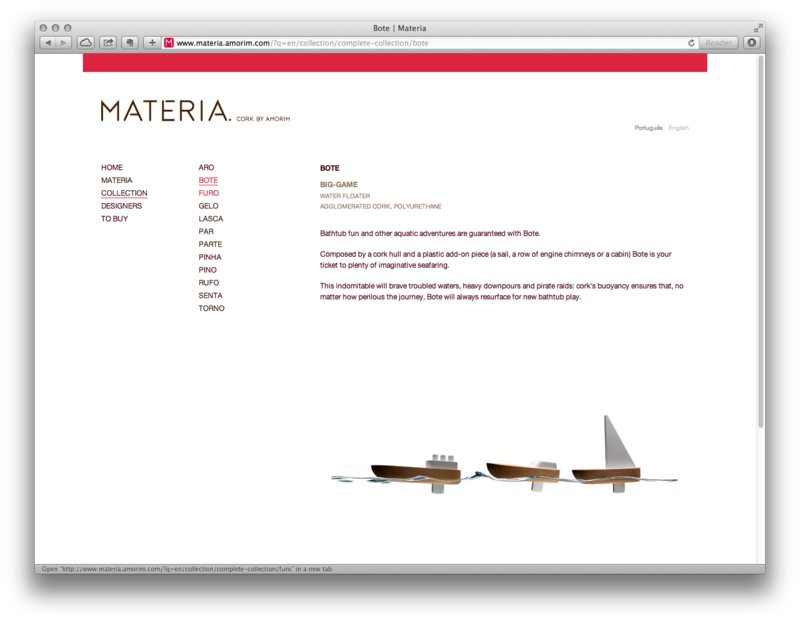 Curated by experimentadesign, it was designed by 10 leading Portuguese and international designers and studios. Cork is nature’s own high-tech achievement. Down to the cell structure, its unique composition and characteristics cannot be replicated by anything man-made. Extracted from the bark of the cork oak -a native specimen of the Western Mediterranean basin- cork is a state-of-the-art raw material, requiring minimum transformation or processing before use. 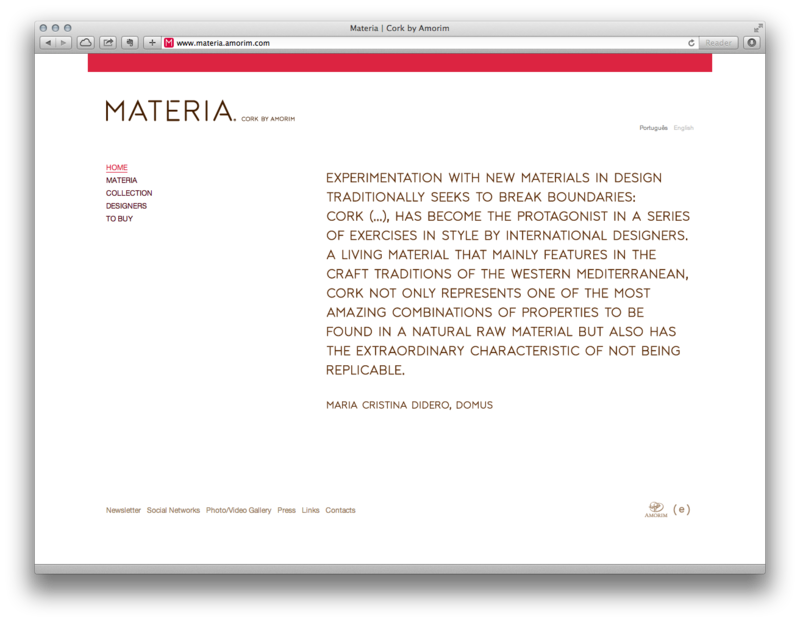 MATERIA will reveal cork’s potential for comfort, functionality and sensory delight. 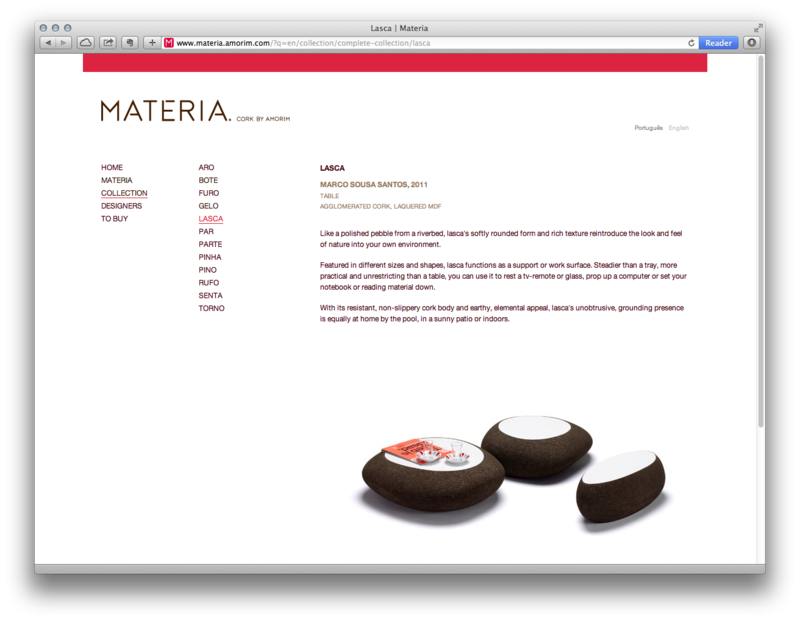 Corticeira Amorim is the largest world producer of cork products and the most international of Portuguese companies. With almost 150 years as the industry leader, it distinguishes itself by its quality, enterprise, innovation and ability to anticipate and respond to market needs. 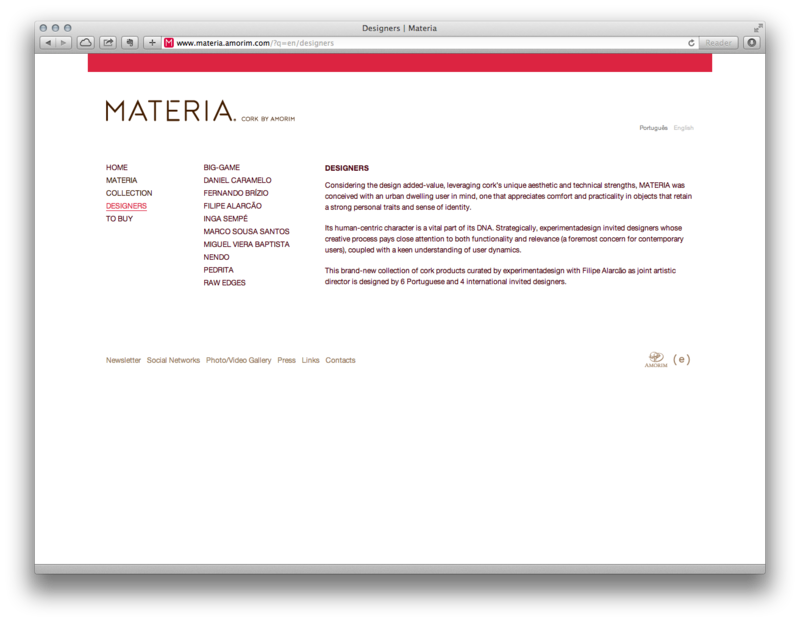 experimentadesign is a knowledge production and project development unit working in design, architecture and design culture. Created in 1998 and based in Lisbon, its primary field of action is creativity and contemporary culture from an inclusive and multidisciplinary perspective. Committed to design as a tool for reshaping contemporary society, generating effective change and positive impact, experimentadesign is actively pursuing responses to the modern-day challenges, both social, human and material, combining creativity, economy, industry, communication, research and innovation. A unique organisation for promoting cork and ensuring the subsequent conservation of cork oak forests, Corticeira Amorim is at the forefront of industry, technology and sustainability.